I'll admit that I'm a rather loyal collector of the Pelikan Souverän M8XX special editions. Yet, I've been able to restrain myself and hold off on quite a few recent editions like the Vibrant Blue and Ocean Swirl. I guess they weren't really my thing anyway, as I wasn't that big on the vibrant colorways of those releases. And then they announced their latest release, the M800 Stone Garden, a few months ago... The same tried and true Souverän pen (that I reviewed multiple times before), but once again built up from a completely new combination of materials. 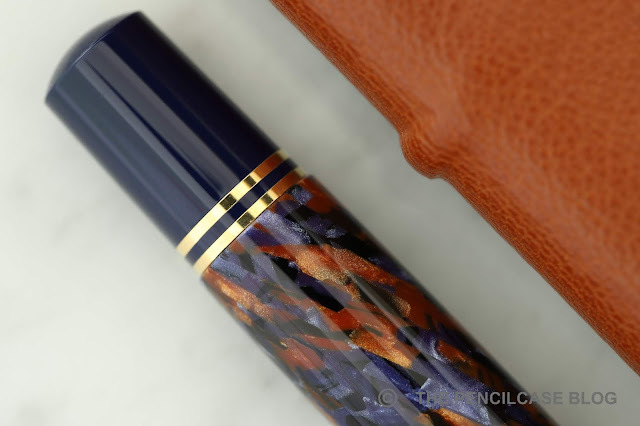 The color combo is definitely unique, combining a dark blue resin for the cap, section and piston knob, and a beautiful brown-blue marbled material for the barrel. As I'm usually not a fan of blue pens, I wasn't immediately hooked. But the subdued color scheme ultimately pulled me over. My thanks to Appelboom for sending one over to take a look at in this review! In person, this is an absolutely stunning pen. The material has a marble-like diagonal striation to it, and the blue and brown flecks create a shimmering light and dark contrast. 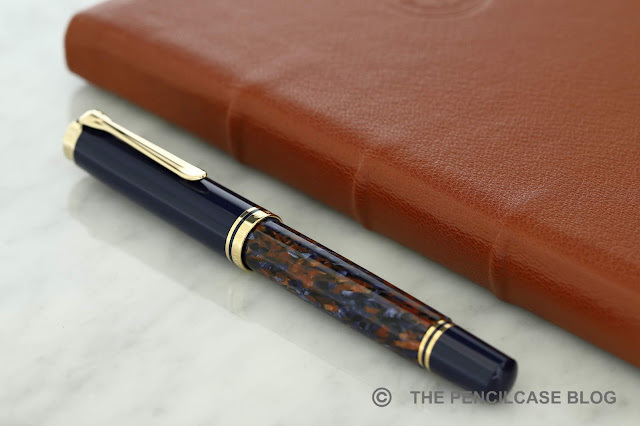 Combined with the gold trim, this is an extremely classy pen. 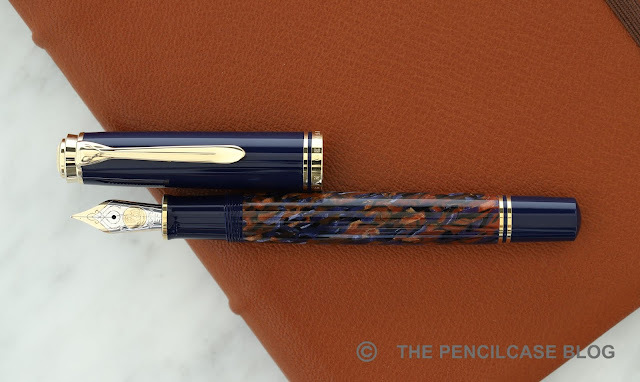 I love how the Souverän pens can appear classic -almost in a vintage way- or modern and sleek, depending on the materials they use (case in point: the Stone Garden vs. the M815 Metal Stripe!). One thing I don't really like, is how the pattern is interrupted by a single seam along the length of the barrel. Pelikan creates the barrel by hot-forming sheets of resin into tubes (called the 'binde'), so you'll always have a seam somewhere, it's just not visible on most materials they use. It's not too obvious, as it took me a good while to even notice it, so it certainly isn't a deal-breaker for me. The Souverän M800 is a fairly large pen, measuring 14.1 cm (5.57") capped, and 12.7 cm (5") uncapped. It posts securely, creating a pen that measures 16.6 cm (6.53"). The brass piston mechanism adds just the right amount of heft, giving a total weight of 30 g. I've raved about the M8XX on multiple occasions before, it's pretty much the perfect size for my hand (with the M6XX a close second, especially if you have smaller hands!). I forgot to take a size comparison photo of the Stone Garden, but you can find one in my review of last years Renaissance Brown special edition! In terms of performance, what can I say? It's an excellent nib. 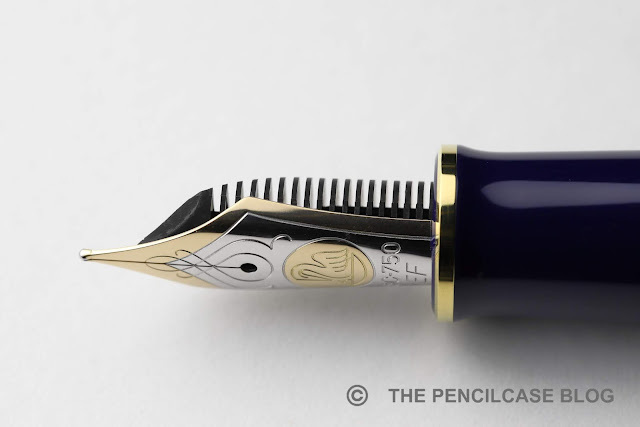 As you may know, I'm usually not drawn towards the finer end of the nib spectrum, but this one is hard to knock. It's a solid performer. Maybe a tad bit boring because of the inherent stiffness of the M800 nibs (when I do buy finer nibs, I like a bit of 'cushioning' in my writing), but the ink flow is consistent (surprisingly not overly wet) and it's ample smooth. When comparing this to a Japanese EF, the line it puts down is still about twice as wide, but nevertheless it should be perfectly usable even when you have small handwriting. I like the new Stone Garden (Who'd have thunk it!). Even though blue pens don't tend to be my first choice, I think they did a fantastic job on the color combination here. It's a classy-looking pen, which is how I tend to like my Pelikans (The Burnt Orange, Tortoise brown, Renaissance,...). I think a professional and subdued color scheme works better with the Souverän design than a more vibrant material (like the new Vibrant Orange m600), but I guess that's just my personal preference. 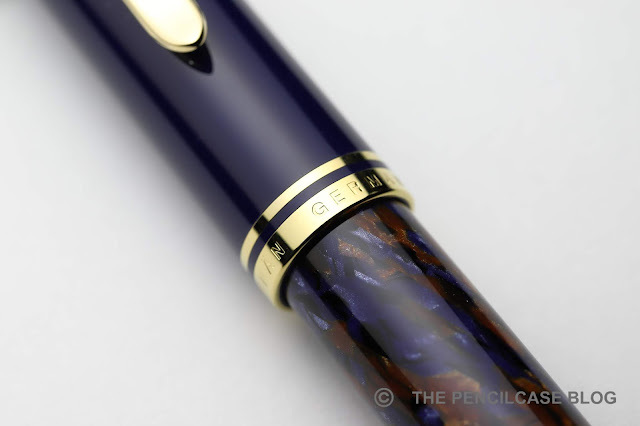 In general -but especially with the special editions- Pelikan is slowly pulling up their prices. 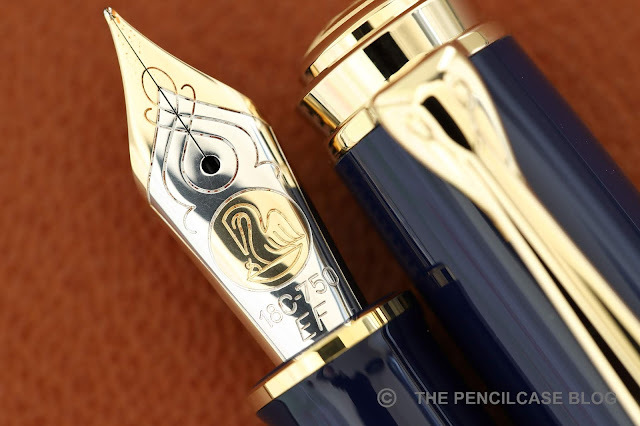 Where they once offered a competitive price compared to say, Montblanc, that price gap is now slowly fading away. 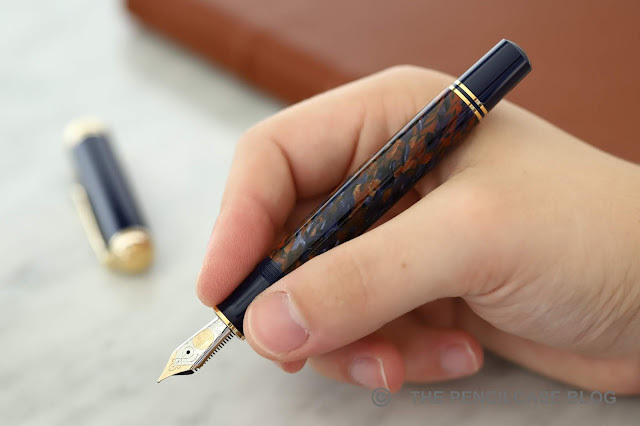 The Pelikan Souverän M800 Stone Garden retails for 519€ (612$) here in Europe. But for the non-EU audience that buy from overseas (like from Appelboom, for example) the price drops down to 437€ (500$) without VAT. The price hike for EF nibs will add about 55€ (65$), which I feel is quite unfair for people that prefer a finer nib. Note: Appelboom is a sponsor of this blog. I received a discount on the purchase of this product. I was in no way influenced in the making of this review, the opinions shared in this review are completely my own! This post does not contain affilate links.